Ring-tailed lemurs are the best known of all lemur species, notorious for its long, vividly striped, black and white tail. 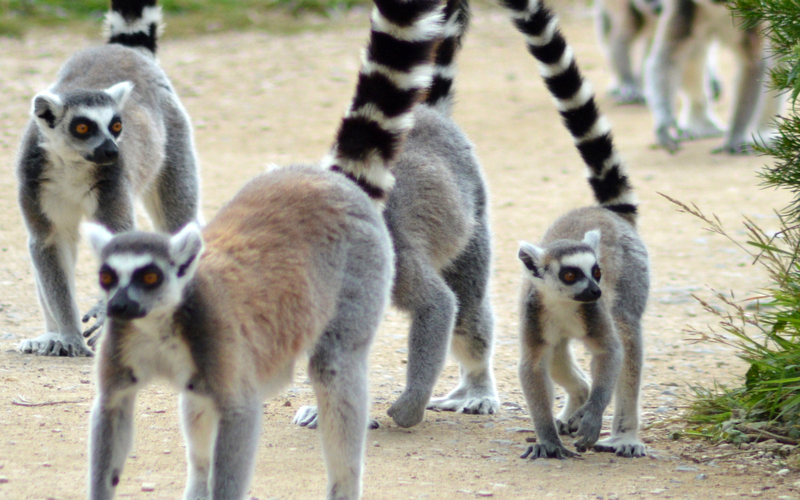 The tail is used as a flag as the lemurs walk, held aloft so others can see. It is also used in 'stink fights' where the animals rub their tails against scent glands on their arms and wave them over their heads at their opponent. Ring-tailed lemurs are very sociable creatures, living in groups from 6 to 30 individuals in small home ranges and the females are dominant within the groups. Ring-tailed lemurs are herbivores. They predominantly feed on fruit which makes up the greater part of their diet in the wild, but they also eat leaves, flowers, tree bark, sap and will occasionally eat insects too. They feed in trees, jumping from branch to branch to avoid the sharp spines, and also forage on the ground. Ring-tailed lemurs are from southern and southwestern Madagascar. In the wild, they live in tropical dry forests, dry scrub, montane humid forests and gallery forests. This species of lemur is classified as endangered with only 10,000 – 100,000 left in the wild. This is largely because the sparse, dry forests they live in are being destroyed for agriculture, charcoal production and mining. You can learn more about the ring-tailed lemurs' conservation status on the IUCN Red List of Threatened Species website.